Should players want to have many attribute points to use the powers, or few, to reach Acceptance and “win” soon? The progress through the Stages was very static. It would be hard to calculate the right amount of points to go through a game. So I added a pool of points for each Stage of Grief. Now, players should try to lose points of the earlier Stages of Grief and win points of Acceptance, and should try to keep as many basic attribute points a possible, as they grant them the option to use powers and to overcome obstacles. And the stage of grief pools determine the order of the stages of grief, allowing for some back and forth between them. But this was too simple: the pools needed to be related in some ways, to allow more interesting decisions. Trying to overcome obstacles requires betting attribute points. The player can also bet stage points from the current stage of grief, but limited to the amount of attribute points bet. If successful, the player will lose a fraction of the bet and will be able to win some Acceptance points and/or to lose some additional points from the current stage. Having a high total of points in the current stage can give some bonus to overcome obstacles when acting in a way corresponding to that stage (with rage, with denial, with melancholy or bargaining). Using powers cost attribute points. There is a way to exchange points from one stage to another, but adding extra points as a penalty. 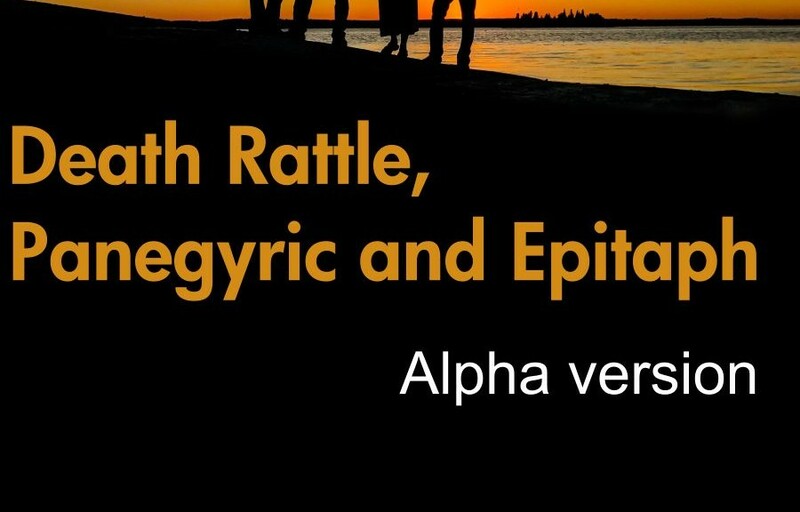 A player can also refill some attribute pools adding extra stage points from the corresponding stage (Anger for Death Rattle, Bargaining for Epitaph, Denial for Panegyric). Now the mechanical part of the game consists on balancing the attribute points and the stage of grief points, trying to change of stage in the right moment, trying not to win too many Depression points and a lot of Acceptance points, and not losing many attribute points to be able to use powers and overcome later obstacles.